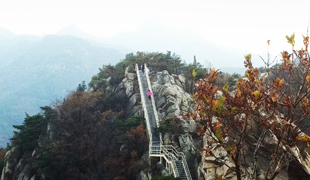 Dobongsan (Mountain), or ‘the path that leads to the summit’ (Dobong in Korean), has 37 rock climbing courses. It is not uncommon to come across a group of rock climbing enthusiasts scaling a cliff. There is a selection of hiking courses that are popular among weekend visitors. Uiam, Sinseondae and Jaunbong Courses are the most highly recommended. Seoul is surrounded by numerous attractive mountains, of which Suraksan (Mountain) is said to be the most beautiful whatever the time of year. 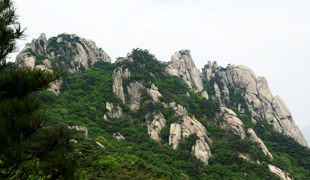 Though the mountain is not particularly high, people sometimes compare its unique beauty to that of Seoraksan and Wolchulsan Mountains. “Surak” means “many waterfalls”, and true to its name Suraksan (Mountain), bordering Seoul, Namyangju and Uijeongbu, has three waterfalls (Eunnyu, Geumnyu and Ongnyu). But that is not all! The mountain is also home to a number of ancient architectural wonders including Heungguksa, Naewonsa, and Seongrimsa Temples and Gwesanjeong Pavilion. Bukhansan National Park is one of the world’s few national parks located in the center of a great city. The natural splendor of Korea’s fifteenth national park is well preserved amid the crowded urban landscape. The mountain is a popular destination for residents living in the greater Seoul area. Legend has it that a prophet was cast to his doom in the split second that he uttered the word ‘Heavens!’ or ‘Acha!’ to himself. Named after the prophet’s last words, Achasan (Mountain) is 287 meters above sea level at its highest point. A dusty trail winds its way up the gentle slopes of the mountain, making it ideal for family excursions. 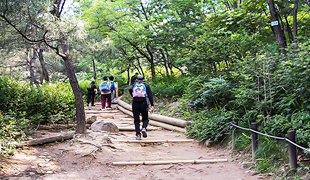 The start of the trail is about fifteen minutes’ walk from Gwangnaru Station subway line 5, exit 1. You can make it to the top of the mountain and walk back down again in less than two hours. The mountain has the greatest number of sites associated with the Goguryeo Kingdom in all of Korea. It was once known as the place where General Ondal was killed in battle. Situated at the very heart of Seoul, Namsan (Mountain) offers dazzling views and a breath of fresh air in the bustling capital city. 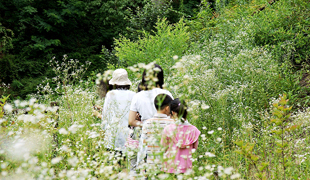 You can stroll among the flowers or take a ride on the Namsan cable car. 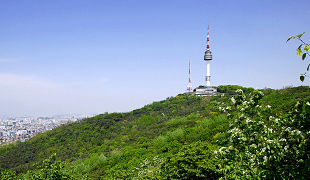 Namsan is one of Seoul’s most recognized weekend destinations. 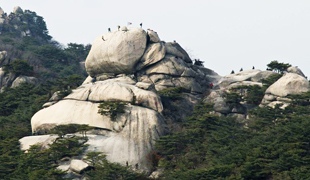 Gwanaksan (Mountain) is well-known for its interesting hiking trails. Many of its summits are huge bare boulders, while its valleys are deep and picturesque. It is easily accessible from the city, and yields up new discoveries with very visit, all of which makes it a very popular spot among hikers. A weekend stroll amid the rose and tree gardens, beautiful flowers, and fields of reeds of the mountain’s outdoor arboretum near Sillim Gyegok (Valley) is highly recommended.